Korean skincare brand, Skin79, has curated a four-piece skincare set to leave the complexion feeling refreshed and revitalised. 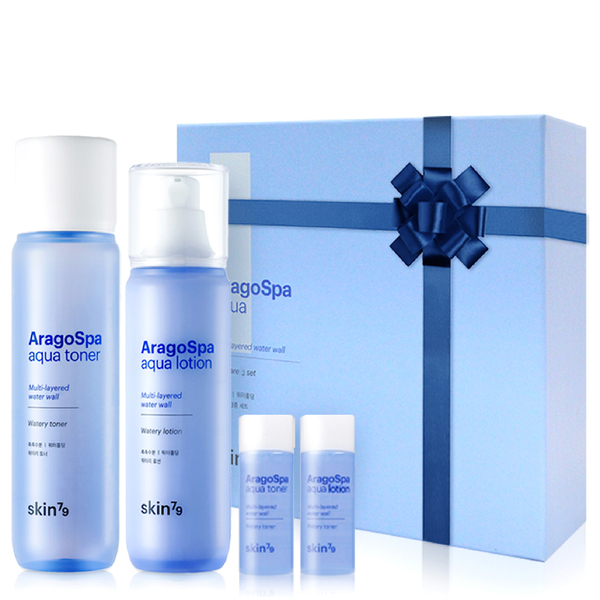 The Aragospa Aqua Skincare Set combines two toners with two lotions, all infused Jeju sourced, Aragonite Thermal Water. Housed in a gift box. A lightweight, non-drying toner that works to soothe, refresh and replenish skin. Harnessing the powers of Aragonite Thermal Water (sourced from Jeju), the luxurious toner infuses skin with long-lasting moisture and hydration, whilst revitalising and rebalancing without uncomfortable tightness. Expect a smooth, radiant complexion that is prepared for the next step in your skincare regime. An intensely moisturising formula that delivers long-lasting hydration. Infused with mineral-rich Jeju Aragonite Thermal Water and Phyto Hyaluronic Acid, the water-binding solution creates a protective moisture barrier on skin, boosting and maintaining hydration levels to keep the complexion saturated and quenched. It utilises a Multi-Layered Water Holding System™ that preserves skin’s moisture, whilst improving elasticity for a healthier, supple-looking complexion. Lotion: Apply to face and neck.